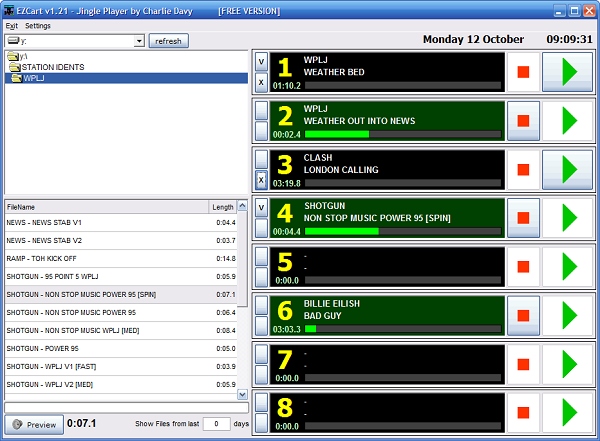 EZCart is a simple jingle player that allows you to drag and drop audio files into 8 playback “cart” slots”. It offers simple start/stop via the mouse, keyboard or can be used with a touchscreen. The main window can be resized to suit your display and each “cart slot” can output to a unique sound device. Simply navigate to a folder, drag ‘n’ drop the audio to a slot and click the “Play” button… Keys F1-F8 also Start/Stop the slots. The slots will attempt to read CartChunk, ID3v2 or basic filename Artist – Title information when loading. Slots can sequence by clicking the button to the left of each slot – when the preceding slot finishes, the next one is started. A V symbol denotes the sequence mode is active. Slots can also be ejected (or not) after playback – Clicking the lower left-hand slot button toggles this mode: X means eject. To manually eject a slot, you can right-click the Play button with your mouse.